Horizontal, Open Cracks - When basement walls start to crack or open up horizontally, this is a sign that they are starting to push in or even buckle. Many times, the horizontal cracks are where the frost line in the outside soil is. When the ground freezes in winter time, frost expands the soil and presses in against the walls. Other times, heavy – wet soil outside the walls is to blame. Vertical Cracks - A vertical crack in the wall can be the result of minor settling in a poured concrete wall. These type cracks will commonly happen at an inside corner of a window opening, pocket for a beam, etc. 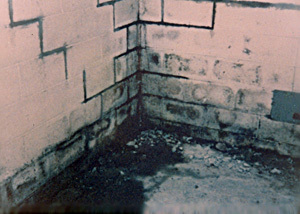 Minor settling in a block basement will usually appear in the form of step cracks. Minor settling cracks of this type are many times, no structural concern, but should be repaired nonetheless. A bowed basement wall is a more serious problem. Step Cracks – These type cracks look exactly as you would imagine; they look like a stairway or steps. Step cracks are only seen in block foundations. Fine step cracks in isolated areas, are many times not a great structural concern. They sometimes happen from minor settling of the footers, a few short years after the home was built. Open step cracks are more of a concern. These usually mean that more substantial settling is taking place. If you see mud, sand or sediment stains on your floors after the water has dried up, this means that the outside soil is also eroding. 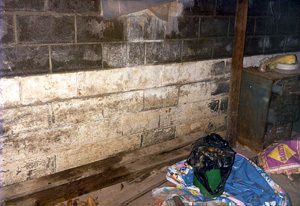 Step cracks can also occur in a bowed basement wall. A vertical crack in a block wall is usually a sign of blunt trauma to the outside foundation wall. Many times, this type of problem is caused during the backfilling operation when the house was being built. Large boulders and rocks in the dirt being used as backfill, can cause this sort of damage. Install drain tile to help reduce hydrostatic pressure on the walls. The walls should be sealed with a product that will expand and contract with the foundation and will bridge the open cracks in the walls. If mud appears to be entering with the water, crack injection with grout and/or soil stabilization grout can help with erosion problems. A bowed basement wall can be supported to help prevent further buckling or bowing. Some companies install steel I beams, helical piers, steel wall bracing channels, etc to add additional support for your walls. These solutions are generally far less expensive as compare to rebuilding the basement walls or foundation. Wall or Floor Settling – Cracks in the basement floor, where part of the slab appears lower than the rest, is a sign of settling. Large, open step cracks in the walls is also a sign. Sometimes, doors or windows in the home can “stick” because settling of the foundation, caused the openings to shift out-of-square. Without doubt, you will need a professional to help you solve this problem. A structural engineer can also help you sort out your options. Some companies offer helical piers or push piers, which can be driven down to the bedrock or down to more stable soil. Brackets are attached between your footers and the piers to support your foundation. These can be installed inside or outside your foundation, depending on your problem. Sometimes, your foundation can even be lifted back up to its original location.